Last week on Brooklyn Nine-Nine, Gina told Jake she was leaving the precinct to pursue her dreams, and this week, Gina must tell the whole team and turn in her two week’s notice. Gina declares that over the next two weeks, each member of the team will receive an authentic, unique “Gina Moment” to remember her by. Also in typical Gina fashion, her announcement is accompanied by a gymnastic routine (she hired a body double for that part), custom sweatshirts for everyone (Amy’s says “Arnie”), and a dance number complete with back-up dancers in gold bodysuits. Gina’s interpretive dance has four movements, each 45 minutes in length, she tells the team. Though we don’t get to see the dance, we do get an episode that is divided into “Four Movements” as we say goodbye to Gina over her last two weeks at the Nine-Nine. It turns out, Holt has been teaching Gina chess for the past four years, and in exchange, she’s been teaching him how to properly trash talk. Gina has never beaten Holt at a game and she’s determined to do so. They play round after round, Holt beating her each time, while they discuss life and Gina’s decision to quit. Holt tries to convince her that she needs a plan, that healthcare is expensive, that she should think of her daughter, that she could pursue her dreams while still working for the Nine-Nine — all of the arguments we’d expect from Holt. Gina asks him how planning his life down to the letter has worked for him, and he tells her he’s achieved every goal he’s set out to do. But Gina reminds him this isn’t true: despite careful planning, he didn’t receive the commissioner position. Sometimes the best laid plans don’t work out, she says, and this is her Gina Moment for Holt. Life is crazy and unpredictable no matter how you plan or don’t plan. Holt realizes she has a point, and gives her his support. Gina also declares herself the winner of their last chess match even though she definitely did not win. But that’s how life works, she says. You make up the rules as you go, and you declare victory. A tearful Amy tells Gina and Rosa she wants to do a ladies lunch to say goodbye to Gina. Gina’s not too excited about the idea, and Rosa couldn’t care less. Rosa, in fact, hasn’t displayed any emotion about the announcement that Gina is leaving. Gina tells Amy that her parting gift to her will be to “fix” Amy — to make her more like Rosa, cool and detached. While they’re out at lunch, Amy presents Gina with a gigantic binder. It is all of Gina’s tweets turned into book form, which is something she had mentioned she’d always wanted. Gina tells Amy this is worse than crying and says she put way too much work into this book. She demands Amy burn the book in the trash barrel behind the precinct to toughen her up. But Amy can’t do it, and she decides she doesn’t need to be fixed. She tells Gina and Rosa that she’s allowed to feel emotion and to be sad and cry about Gina leaving. Gina says that was her real Gina Moment for Amy — to “just be yourself.” Even Rosa starts crying at that important life lesson, and the reality that Gina won’t be around to impart her little nuggets of truth much longer. Jake is planning Gina’s going away party, “Gina-a-rama,” and wants it to be super splashy and over the top, just like the woman herself. He decides they need a celebrity and bounces around for who has the connections to make that happen. Terry has a friend who works private security for Mario Lopez, so they zero in on him. They find out from Terry’s friend that Mario will be at the Manhattan Social Club that afternoon, so Jake and Gina dress up like the uber-rich to infiltrate the swanky establishment in hopes of seeing the man who played A.C. Slater on Saved by the Bell, and was the childhood crush for both of them. Once they trick the doorman into letting them in, Jake distracts Mario’s security guards so Gina can beg him to come to her party at the bar later, under the pretense that it’s a charity benefit for “hungry monkeys.” But when Mario arrives that evening, Gina turns him away at the door, much to Jake’s horror. After Mario’s gone, Gina explains that this was her Gina Moment for Jake: to remind him that she doesn’t need some celebrity or swanky party. All she wants is to hang with her friends and have a few drinks. “You guys are all the splash that I need,” she says. Plus, she confesses, she’s always wanted to turn a celebrity away from her party, so this was also her Gina Moment to herself. Gina’s two weeks are officially over. It’s the start of a new week at the Nine-Nine, and the first day without Gina. Boyle and Terry are disappointed because Gina had said everyone would receive Gina Moments but neither of them got one. 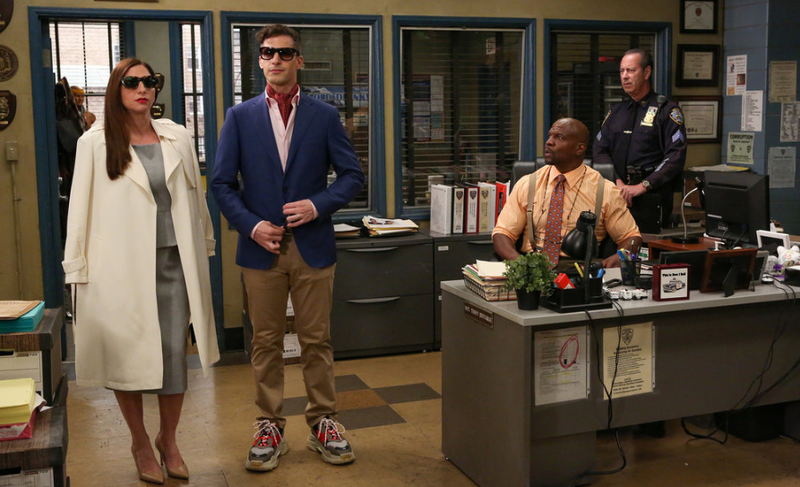 When they walk into the precinct, though, Gina is there! She says she’s just there to clean out her desk and wrap up some last things. As her Gina Moment to Boyle, she gives him back the Boyle Sourdough Starter which she won in a bet a while ago. She has nothing for Terry though, and he is super disappointed. On Tuesday, Gina is there again, and she’s there on Wednesday as well. And on Thursday. It seems she’s having trouble leaving and keeps making excuses for why she still needs to be there. She finally admits to Jake that she’s scared to leave. Jake calls an emergency meeting with the rest of the team to figure out how best to support Gina so she’ll have the courage to leave. But when they walk in on Friday, there’s a copper statue of Gina texting on her phone and a video message from her. She begins by saying that all of Terry’s kind words for her really made a difference. Just as he starts to get teary-eyed about that she yells, “Psych!” and declares that his Gina Moment. He’s bummed until she admits his real Gina Moment is that she signed him up for an International Yogurt of the Month Club, and his first yogurt, from Austria, is in the fridge waiting for him. He declares he received the best Gina Moment of all. Gina continues, saying she was never actually scared, she never doubted herself or an instant, it’s just that there was a shipping delay with her statue and so she couldn’t leave until it arrived. And now, it appears, Gina Linetti has officially left the Nine-Nine.